Sears lawn tractors are one of the best known brands in the USA. Thanks to the numerous Sears stores throughout the country, as well as a decades-long history of providing American shoppers with their needs, Sears has become a legend.. 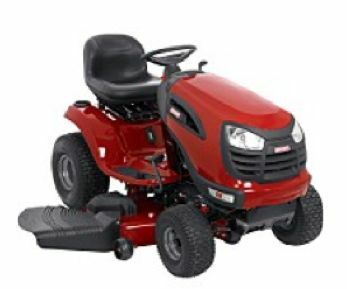 In recent years, Sears lawn tractors are primarily directed to the entry level market. This means you will not find a great deal of “higher end’ models in the lineup, although some nice professional grade machines are offered. The discriminating shopper may recognize similarities between the Sears lawn tractors and those of a competitor - Husqvarna. This is because both brands are manufactured by the same American company. Sears lawn tractors are divided into two convenient categories - machines designed to mow areas greater than 2 acres, and areas less than 2 acres in size. The tractors available from Sears designed for the smaller lawns in mind are much more common, with over six different basic models to choose from. Some modifications to the usual models are done to meet the California standards. There are fewer models for the really big lawns ( greater than 2 acres). Two of those models are reviewed here. The front axles on all the less expensive tractors are fabricated of fabricated steel. On the higher end machines, cast iron is used, which is the sturdiest material available for a lawn tractor front axle. Since the available literature does not clearly state which models have which, check on the showroom floor before buying. The deck design on all the Sears lawn tractors feature the ‘step through’ design. This eliminates any obstructions in front of the drivers seat. This allows for easy entry and exit from the tractor without the need to lift feet and legs over a raised portion of the frame. Sears lawn tractors designed to mow less than 2 acres. There is quite a bit of variability here in price and quality. The least expensive machine offered is the model LTS 1500. Powered by a 17.5 HP single cylinder Briggs and Stratton overhead valve (OHV) engine without an oil filter, this is the lowest power rating a riding mower could dare to feature. The cutting deck is 42, and is raised and lowered to the desired cutting height using a manual lever. The PTO is engaged manually. The transmission is a manual gear type, which demands less horsepower from the engine. This is priced for a tight budget, going for $1200.00 when not on sale. The model LT 2000 is a similar machine, but is equipped with a 20 HP single cylinder overhead valve (OHV) Brigs and Stratton engine. A fully pressurized oil system with replaceable oil filter comes standard. The stronger engine is able to handle a hydrostatic transmission, which provides smoother power. The cutting deck remains 42”, and is engaged using a manual PTO. The added features of this model bring the price up to about $1600.00. Next is model YT 3000 , which has higher 21 HP single cylinder Briggs and Stratton engine or a 22 HP Kohler twin cylinder overhead valve engine. Both have fully pressurized oil systems, with a replaceable oil filter. The cutting deck width is the standard 42”, with a manual PTO engagement of the blades. The transmission is also a manual gear type, which helps keep the price down to about $1700.00 when not on sale. The model YT 4000 , which has higher 24 HP twin cylinder Briggs and Stratton engine. This engine has fully pressurized oil system, with a replaceable oil filter. The cutting deck width remains 42”, with a manual PTO engagement of the blades. Upgrades include a hydrostatic transmission. The price? About $2200.00 due o the more powerful engine and hydrostatic transmission. Continuing with the theme, model YT 4500 sports the most power and features of any of the YT models. A 26 HP Kohler twin cylinder overhead valve (OHV) drives a hydrostatic transmission. The cutting deck is a generous 54”, and is engaged by an electric PTO. This engine has fully pressurized oil system, with a replaceable oil filter. Count on spending bout $2500.00 for tis fin machine. Topping out the lawn tractors designed for 2 acres or less, model PYT 24 HP features a Briggs and Stratton 24 HP twin cylinder overhead valve (OHV) engine, which powers a hydrostatic transmission. The cutting deck returns to the standard 42 “, and is engaged by an electric PTO. Cutting height is manual, using a lever. This engine has fully pressurized oil system, with a replaceable oil filter. Like it’s close cousin YT 4500, this machine lists for about $2500.00. Sears lawn tractors designed to mow more than 2 acres. We will review 2 models designed to cut larger lawn areas - the GT 5000 and PGT 9000. Both are very attractive machines, with added power and features. GT 5000 is a muscle man, with a 26 HP Kohler overhead valve (OHV) twin cylinder engine, complete with pressurized oil system and filter. The cutting deck is a generous 54”, engaged by an electric PTO. Transmission options are either manual gear or hydrostatic ( add $300.00 for the better transmission - it will be worth the cost). The price will be about $3000.00 to 3300.00 when not on sale, depending on the transmission. Finally, the model PGT 9000. It even sounds powerful, doesn't it? A 28 HP twin cylinder overhead valve ( OHV) Briggs and Stratton engine purrs under the hood, and easily powers the 54” cutting deck. Of course an electric PTO and hydrostatic transmission round out the deal. Count on spending about $3600.00 for this macho machine. Most customers that buy a Sears lawn tractor buy another in the future, based on high satisfaction.